Bob Elliott received a basketball scholarship and came to Tucson from Michigan to play basketball for the University of Arizona coached by Freddie “The Fox” Snowden in 1973. He was a standout on the basketball court. He would average 18.7 points per game. He scored over 2,000 points while hauling down over 1,000 rebounds in his college career. He was named to several All-American teams in his career but he was also a two-time Academic All-American at the same time. Bob was chosen in the second round of the 1977 NBA draft by the Philadelphia 76’ers. He would also play for the New Jersey Nets where he would end his Pro basketball career. 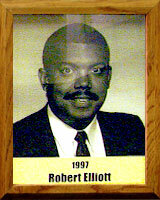 Bob was inducted into the GTE Academic All-American Hall of Fame in 1995. He would become a very successful businessman after getting his CPA degree from the U of A. He has teamed with Dave Sitton for many years to do the T.V. commentary for the University of Arizona basketball games.